This roasted beet dip with goat cheese gets plenty of flavor from garlic and roasted fennel. Serve this up as a colorful and healthy option on a buffet menu or other holiday gathering. Read on for details and pairings suggestions, or click here to jump down to the recipe. I wouldn’t say anyone in my family would consider themselves a huge beet fan. For a long time, beets were on a very short list of veggies that I don’t like. But I’ve found a few ways to serve and enjoy them over time. The key for me is to grill or roast the beets to give it a nice caramelized sweetness. On Thanksgiving, we gather at my parents’ home and my Dad was the main cook for the big feast. 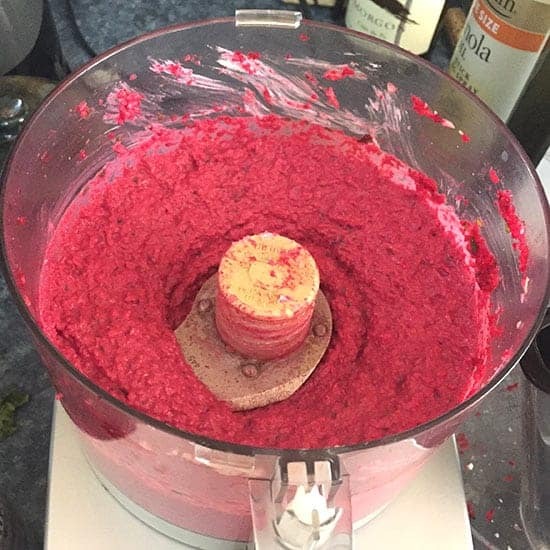 I needed somewhere to channel my cooking energies on this food-centric holiday, so decided I would take on the challenge of coming up with a beet dip recipe that the family would enjoy despite lukewarm feelings about the veggie. I did some research on flavors that go well with beets. Fennel featured prominently as did basil. So I figured I’d roast fennel along with the beets, then add some basil. Of course, there would be goat cheese involved in this beet dip too. My family might not like beets a lot, but garlic is a different story! While the fennel and basil definitely helped add some good flavor to the beet dip, I’m pretty sure it was the healthy amount of garlic flavor that won the family over! You could use two rather than three cloves of garlic for a bit less kick. Speaking of garlic flavor, I noticed that people search for beet dip recipes with sour cream and horseradish. I could see the strong taste of horseradish playing a similar role to what the garlic did for this recipe. You could definitely try swapping garlic for a bit of horseradish if you were so inclined. I did add a bit of of sour cream to this beet dip recipe to enhance the consistency. 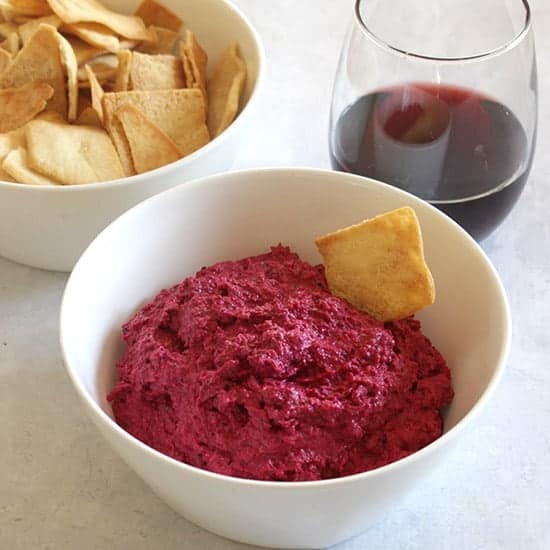 I served this roasted beet dip with pita chips, and it was a big hit! People were surprised at how much they liked this recipe featuring a vegetable they thought they didn’t like. The best sign of its popularity is that there was only about a tablespoon leftover despite everything that was available for our pre-feast nibbling! How to make beet dip? This is a pretty easy recipe, so let me share a few notes for making this roasted beet dip to get you started. Two medium beets should give you the 2 cups of chopped beets called for here. Some beets come larger in which case you might only need one. Peel the beets before chopping, and save those healthy beet greens for another use. Here are 5 recipes for beet greens that sound good to me, from Mother Nature Network. 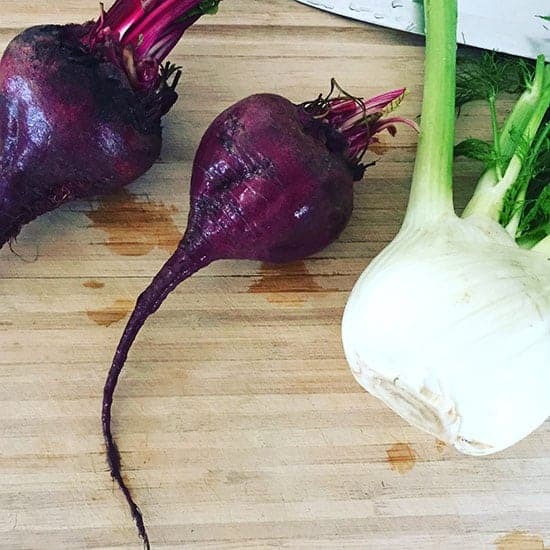 The beets in this recipe get roasted along with a fennel bulb. Cut the green stems off from the white bulb, and then chop the bulb. Slice off the wispy green fronds at the end of the stems, and chop that up. It adds a nice little licorice flavor to the dip and other foods you may be making. When you roast the beets and fennel, you want the veggies to get good and tender so that the dip won’t be too chunky. Check the veggies with a fork. You should be able to pierce them easily when they are ready for the dip. You may want to remove some that are done and let some bigger chunks roast a bit more. Once the veggies are roasted, you puree them with the other ingredients. You could play with the amount of sour cream to adjust the consistency. You might think the addition of soy sauce seems a bit out of this place in this recipe which leans toward Mediterranean flavors. I will sometimes add a dash of soy sauce to a recipe to add a bit of umami, and that seemed to work here. I tested the roasted beet dip with two wine pairing options. I thought with the spice it might go nicely with the sparkling Spumante wine we had open to start on Thanksgiving, but for some reason I didn’t care for the match. I then poured a small taste of the red Burgundy I had brought for the turkey, and that pairing worked much better. Pinot Noir is known to go well with the earthy quality of beets, so that makes sense. I tried the little bit of leftover beet dip with a beer, an IPA style, and that worked pretty well too. 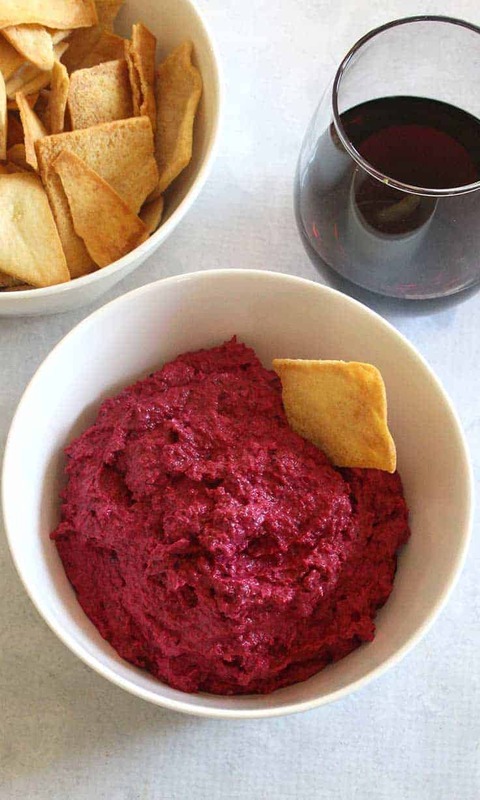 So I’d say pair our roasted beet dip with a Pinot Noir or grab a beer to go with it. This brilliant red roasted beet dip made with garlic and roasted fennel is a flavorful and healthy change of pace from your usual dips. 4 ozs goat cheese – leave at room temperature while the veggies roast. Preheat oven to 400 degrees. Toss the chopped beets and fennel with 1 tablespoon olive oil. Spread out in a single layer in a roast pan. Roast for 35 to 40 minutes, until the vegetables are tender and easily pierced with a fork. Remove vegetables when done. Give them a few minutes to cool, then move to a food processor along with remaining olive oil and the garlic. Pulse to chop the vegetables thoroughly. Add the basil and goat cheese to the food processor, pulse to combine thoroughly. Add the sour cream, soy sauce, fennel fronds and black pepper. Pulse to combine. The beet dip is ready! Scoop into a serving dish and serve along with pita chips or crudite. You can refrigerate to serve late or the next day. To prepare the fennel, cut the stem off the bulb. The bulb gets chopped and roasted. The feathery top part of the stem is the frond, which gets chopped and added to the dish. As Rob notes in the comments, this dip freezes well. Consider doubling the recipe and keeping some for another time. Also from Rob’s comment, you can reduce the garlic a bit and add Worcestershire sauce for alternative flavor. Having the goat cheese out of the fridge while you roast the veggies will help make it softer and mix with the other ingredients easier. If you try this beet dip recipe and like it, you might also want to try roasted beet hummus–here’s one recipe for beet hummus from Minimalist Baker. Beet powder is such a cool idea. Never heard of it before. It probably reduces the mess. YUM! I tried some sort of beet dip/spread a few years back but it was way too salty. I have to try your version!!! I am so into beets lately and fennel is one of my favorite vegetables so I can’t wait to try this. I didn’t like beets when I was younger but they are a favorite now, roasted at least. This sounds tasty – loe the color. roasted and grilled, that’s how I like beets now. Have come across raw shavings in salad that I like, too. This is a great recipe! Thank you for sharing, I am not a huge garlic fan, so reduced that to one clove and I roasted it with the vegetables for a milder taste. To replace the kick of the garlic, I added some Worcester sauce and that worked really well. Everyone loved this dip. I would add that it freezes well, so I doubled the recipe and already have my Thanksgiving appetizer ready! Thanks for the feedback, Rob! Sounds like a good adjustment to tone down the garlic. And good to know it freezes!